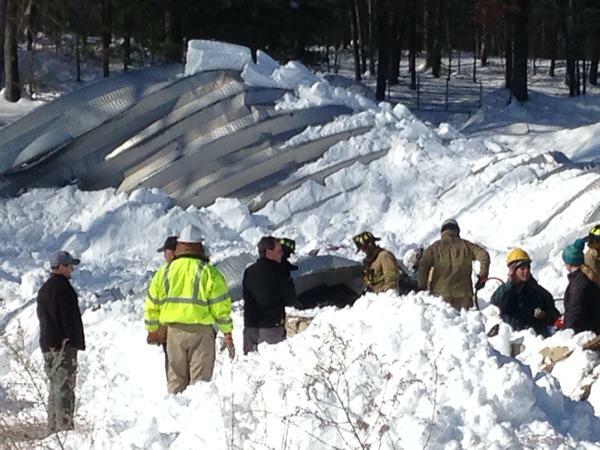 In Westford, Mass., the barn at Bobby’s Ranch collapsed killing two horses and trapping five more. Firefighters and volunteers worked throughout the day to free them. Everyone knows that here in New England we’ve had too much snow. But unless you’ve lived through this kind of weather, you may not think about the consequences beyond the inconvenience of slogging through three or four feet of compressed snow, bone chilling temperatures and roads barely wide enough for a car to pass through. One of the big concerns right now are the roofs. This much snow is very heavy and getting so much snow in such a short period of time is causing big problems — roofs are collapsing and ice dams are causing water damage. 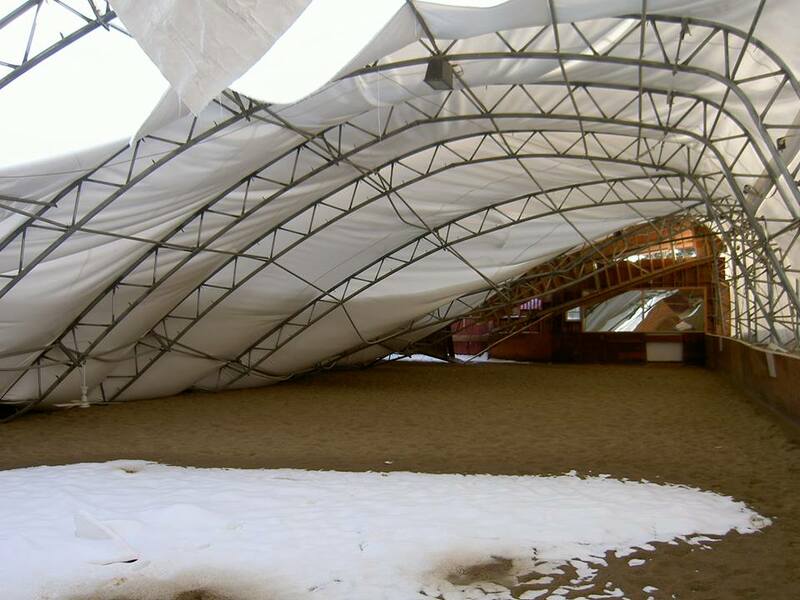 The indoor arena at Highland Hill Farm Collapsed. Luckily no one was injured. Already in the news I’ve read about two indoors and two farms farm where the roofs have collapsed. The video above details the plight of Bobby’s Ranch, long a fixture in Westford Mass. When their barn collapsed two horses have died and five were injured. Firefighters worked all day to get them out of the snow and a vet had to crawl into the collapsed barn to sedate the remaining horses to get them out. 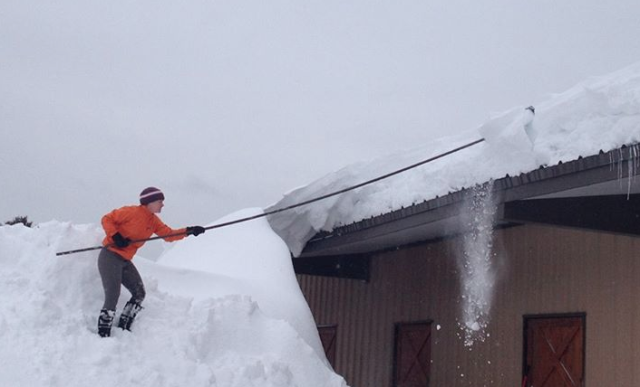 Clearing snow from the roof of Dry Water Farm — before it collaped. immense damage, large bills and sadly, tragic losses. I’ve read comments on news reports that the barn owners were negligent for allow the snow to collect on their roofs, but I don’t think people understand just how much snow there is and just how hard it is to get it off. There are crews of people out shoveling snow by hand, but having your roof cleared can cost thousands of dollars, and shoveling yourself can be dangerous. In both instances where I know the details, the owners were shoveling off the snow — it just wasn’t enough to make a difference. I’m lucky that I don’t know any one yet who has had their roof collapse, but I’ve read that more than 100 people have reported full or partial roof collapses and I have numerous friends with ice dams who have seen water leaking into their homes. At home I watch the ceiling carefully for cracks and jump every time I hear the house make an unfamiliar noise. So please, if you’re in New England, do what you can to help your friends and neighbors. And don’t judge. Those of us in the South love to complain about the snow (mainly because we’re really having fun!) but I know many whose hearts go out to those in New England. I cannot even imagine what it must be like for them. So sad for those two horses, but thankful for the individuals who worked so hard to get them out. this is just so sad… hopefully the snow clears out sooner rather than later!